Fanfare Delight Cowl – a delightfully quick and simple crochet scarf which will encourage you to learn some new stitches. Make some for yourself, or as gifts for special women in your life. The ... beautiful, textured, delightful. 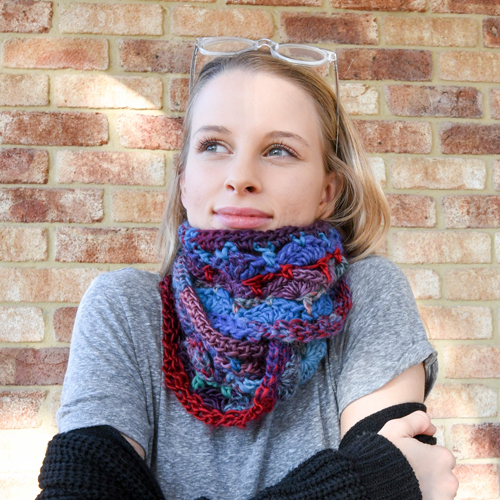 With a choice of Beginners or Intermediate versions, anyone can create the Fanfare Delight Cowl. Choose your favorite chunky yarn – but make sure it’s SOFT! This scarf makes a perfect gift for yourself, or for a special lady. Intermediate crocheters can stretch themselves and learn new stitches. Beginners can complete this using the simplified version. Create in one color, 2 colors, variegated and different textured yarns to achieve different effects. This crochet pattern has been tested by independent crocheters (lots of their photos are in the gallery). Choose the Beginner or Intermediate version, depending on your skill level. I loved crocheting this cowl . The pattern was easy to follow , quick to make and I learnt a few new techniques easily . The best thing is that I now have a beautiful cowl which will make a excellent present for my sister and it will keep her warm in alpaca and wool now that winter has started . It has such pretty stitches but is so light to wear . Thank you so much for your wonderful review, Meg! I really appreciate you taking the time to TEST this pattern – and the photo of your cowl was beautiful! I used a lighter yarn (somewhere between 8ply and 10ply) but had to go to a 10mm hook to obtain a similar gauge. The pattern was easy to follow and worked up really quickly. The cowl is super soft and so light to wear but still lovely and warm. I’ll be making more of these for sure!